Posterscope held business for more than 20 years. Industry observers said Havas’ decision to switch its OOH spend in the UK and Ireland to Talon is significant because such moves are rare in the sector and it will affect market share among the three leading agency players. Havas, which looks after brands such as O2, the BBC and Hyundai, has a relatively small share, estimated to be around 4%, and set up its own OOH buying operation, Adcity, in 2016. 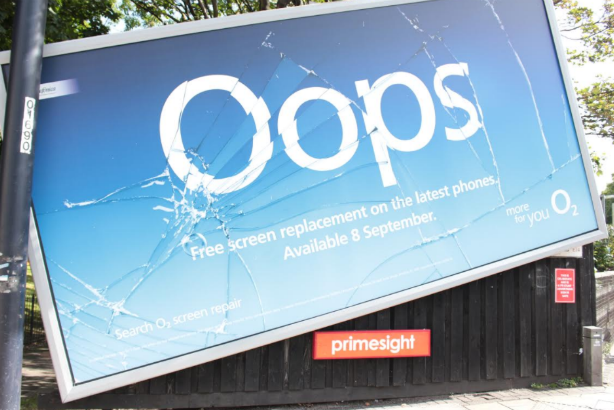 It is understood that Talon will handle all buying, including for Adcity, which is expected to focus on OOH planning and smart data after success with campaigns such as O2’s "Oops". Havas clients are thought to spend £40m-£50m annually on OOH. Winning the Havas business is likely to help independently owned Talon to challenge Dentsu Aegis Network’s Posterscope for second place behind the market leader, WPP’s Kinetic. Industry sources suggested Talon’s estimated share will jump from 20% to about 25% and Posterscope will see its estimated share shrink from close to 30% to about 25%. Talon has had an additional fillip after picking up the UK government’s Crown Commercial Service account recently via its relationship with Omnicom. Kinetic remains the market leader with more than 30% of the UK OOH market. Interpublic’s Rapport is another leading player with about 10%. Havas’ move to Talon is set to take effect in January. It is thought that part of the reason Havas moved its OOH business is because it was wary of delegating business to a rival, Dentsu Aegis Network, in an increasingly competitive market. Havas, which has changed a lot of its UK leadership in the past two years, has had a relationship with Posterscope going back at least two decades. Talon is independent, after Omnicom exited as a minority investor and sold its stake to Mayfair Equity Partners last year, but it continues to handle Omnicom’s OOH business. Market share can be important for agencies when they negotiate annual trading deals, although some industry insiders cautioned that small shifts have limited significance. The shake-up on the OOH agency side comes at a time when there are major changes happening among media owners, with the number of major players shrinking from six to four after Global bought Exterion Media, Primesight and Outdoor Plus. Global will have an estimated 32% share, just behind JCDecaux on 36% and ahead of Clear Channel (18%) and Ocean Outdoor (8%). The UK's estimated £1.2bn OOH sector is unusual because specialist poster buying agencies wield a lot of power – unlike in many other markets. Six global agency groups – WPP, Omnicom, Publicis Groupe, Dentsu Aegis Network, Interpublic and Havas – dominate mainstream media buying but only WPP, Dentsu Aegis Network and Interpublic handle OOH themselves in the UK. Publicis Groupe uses Posterscope, while Havas will now join Omnicom in using Talon. Havas, Talon and Posterscope all declined to comment.